When my father worked at the museum the specimens were kept in apothecary jars that had ground glass closures. The sizes were inexact..a little shorter, squatter, taller or thiner. Decades ago a conversion was made to glass jars with rubber gaskets, and the museum got rid of the hand formed ground glass apothecary jars. I kept some small ones. Jane kept larger ones. Many times the lids were closed so tight they could not be opened. Since they held formaldehyde we never really used them, mostly just for their cool look. After the fire last winter the cleanup crew took everything out of every kitchen cabinet and cleaned all. Now every apothecary jar opens easily, though all were empty. 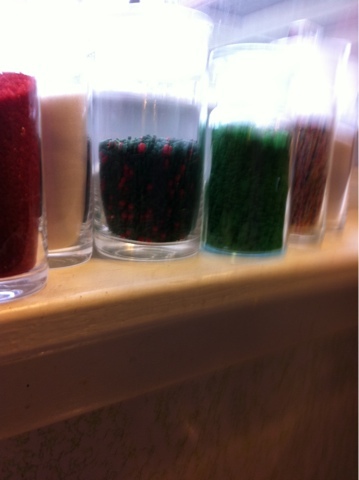 Decorating for Christmas has begun, and I looked at those jars and some containers of cupcake decorations and realized the two must become one. 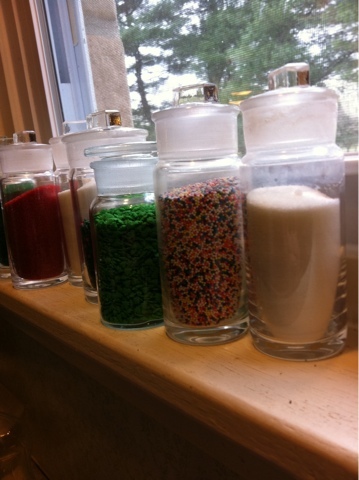 We will never eat those sugars, and the jars look great out of the cabinet and filled with the fun colors. Now to find some holly. All that is here is white pine and cedar, need that pop of red..